So how long really until we find ourselves in a period where truly everything can be or will be tracked by the Internet? Perhaps it’s because what is truly exciting (and useful) about Big Data and the Internet of Everything is not really understood by the general public just yet; the concept of tracking “everything” doesn’t sit quite right with everyone. Overall profits and business development aside, what is so important about location-enabled data is the chance to achieve efficiency across all industries. Locating efficiencies is particularly important for healthcare. Smart or “wired” hospitals are able to improve patient care substantially by embracing ideas associated with the Internet of Everything. 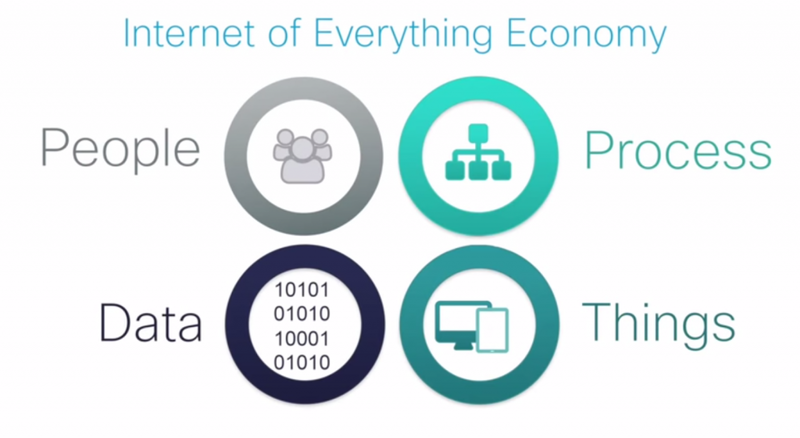 The image above depicts the Internet of Everything Economy according to Cisco, and the interactions of its four main categories: people, process, data, and things. For doctors and the hospitals the mobility of ideas, communication and resources enables them to focus on what is truly important: patient care. Innovation giant GE likens the Internet of Everything to the Industrial Revolution, which we all recognize as a period defined by its immense growth advancement in technology, manufacturing, and human –machine interaction. In 2014, the Tech Revolution has come to fruition with the help of mobile devices, cloud-based applications, and social media. Each technology has played a transformative role in defining –and internationalizing—modern networking (and networks) and has created a demand for innovation. In almost every industry there is a move towards improving the immediacy and accuracy of interactions and services.3 The technology that is already helping healthcare achieve this efficiency? Real-Time Location Systems.